"Serving the citizens of Hall County since 1859"
The Sheriff holds an elected office, which is voted on by the citizens of the county. The Sheriff is elected to a four year term and he or she may serve additional terms if re-elected by the citizens. Rick Conrad is the 32nd Sheriff to serve Hall County. Location: The Sheriff Offices are located at 111 Public Safety Drive on the east edge of Grand Island, Hall County Nebraska. Mission Statement: The mission of the Hall County Sheriff's Office is to preserve a safe environment for all the populace, and to serve the people in all components of the civil and criminal justice systems by effectively, efficiently and fairly enforcing law. Business Hours: 8:00 a.m. to 5:00 p.m. Monday-Friday. Title Inspection Hours: 8:15 a.m. to 4:00 p.m. Monday-Friday. 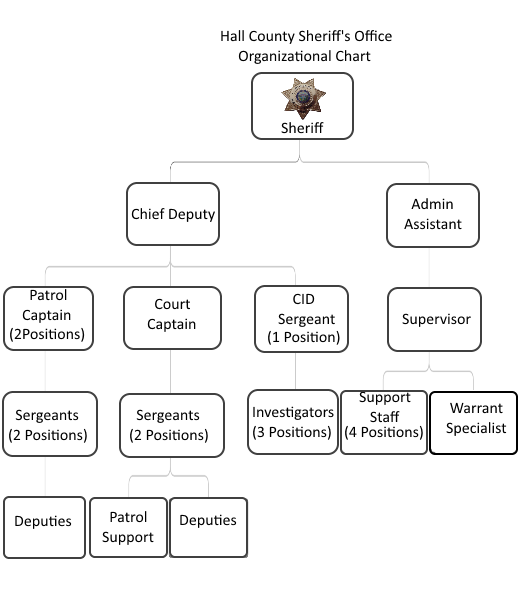 Organizational Structure: The Hall County Sheriff's Office has 44 positions on staff. 32 positions are full time sworn personnel consisting of the Sheriff, Chief Deputy Sheriff, 3 Captains, 5 Sergeants, and 22 Deputies. We have 10 full-time support staff civilian positions and 2 part-time support staff civilian positions. The below organizational chart reflects our current structure.